At the top of a hill overlooking Loughshinny stand the ruins of an old Church, the last surviving remains of Baldungan Castle. The Church dedicated to the "The Sweet Mother of God" is said to have been originally built by the Knights Templar. When the knights were suppressed in 1313 the Archbishop of Dublin acquired the land at Baldungan and in 1350 Sir Reginald de Barnwall obtained it in trust from the Archbishop. It passed to the De Bermingham family and then as a marriage settlement to the St Lawrence family of Howth in 1508. The castle was very much extended and fortified over the centuries and by the mid 17th Century took on a formidable appearance. It formed a near perfect square with four towers of equal height to the Church tower at each corner and covered about three times the area of the present church. It straddled the present day road from Loughshinny Cross. In the Confederacy wars the hostilities lasted in County Dublin from the end of 1641 to the sacking of Baldungan Castle in June 1642. The Government forces were in command in Dublin in March 1642. 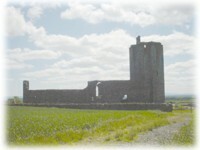 They defeated the rebel Lords of the Pale who made a stand at Kilsallaghan Castle. The remnants regouped at Baldungan to make one last stand in June 1642. The siege lasted three days but Colonel Crawford took the Castle when two of the towers were blown up. Over 250 people were slaughtered and two Catholic priests were captured and later hanged. The castle was never repaired and over the intervening years fell gradually into ruins.